Vintage rattan chair with cushions made of Injiri organic cotton textiles from India. Textile has areas of hand embroidery and hand tied tassels at edges. Reverse painted glass with Asian and European figures on gold leaf. Updated wiring and hardware. Custom black linen shade. Painted plaster cow on wood base with black painted metal shade. Vintage. 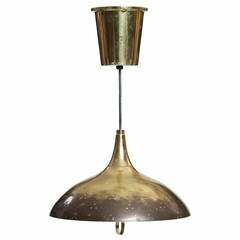 An adjustable patinated brass pendant having as shapely perforated shade and frosted glass diffuser with a brass ring pull. Recoiled cable is concealed in the canopy. 1970s pendant hanging lamp. Good and working condition, consistent with age and use. 1960s aluminum pendant hanging lamp. Good and working condition wear consistent with age and use. An example of Lightolier combining Italian lighting and design with American components. Frosted glass and lacquered metal. 1980s French design pendant hanging lamp. Good and working condition, beautiful patina on the brass.